NAVAL STATION ROTA, Spain — This military base is primarily for the Navy, but Marine Corps spirit is alive and well, too. Sgt. 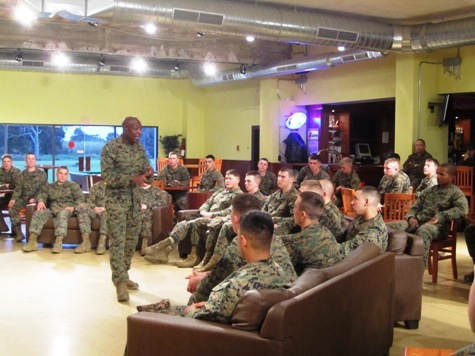 Maj. Carlton Kent, the Marine Corps’ senior enlisted adviser, visited here yesterday and today, taking questions from Marines and delivering senior leadership’s point of view on major issues. At multiple visits across the base, he touched on issues ranging from the planned drawdown of the Corps after combat operations end in Afghanistan to the forthcoming repeal of the Don’t Ask, Don’t Tell policy. Most of the Marines present are with Fleet Anti-Terrorism Security Team Europe, better known as one of the Corps’ FAST companies. They’re among the first Marines considered for deployment when something goes sideways in a country like Egypt. We’ll have much more about Kent’s trip, the Marine mission in Europe and the sergeant major’s last few months in the service in a forthcoming Marine Corps Times.